Kristina has been practicing wound care since 2002. Her career started as a motivated licensed telemetry nurse assisting with bedside wound care procedures and proceeded to continue her education to an advanced practice registered nurse. Having completed her Associate degree at Glendale Community College in 2001, she returned for her Bachelors in Nursing Science at Grand Canyon University graduating in 2007. As her love for education continued, in 2009, she returned to school for her Masters in Nursing Science at University of Phoenix, completing in 2011. 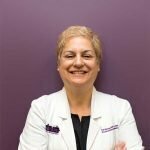 She is a certified wound specialist through the American Board of Wound Management, since 2008. She discovered her calling for wound care while working in a local wound clinic in 2003. From there developed several programs including overseeing progression of an outpatient ostomy clinic in Glendale, Arizona. She continued to influence wound care provided to patients in hospital based settings and development of staff education programs and mentorship. Kristina is active in the Wound Ostomy Nursing Society (WOCN) local chapter and mentors students and aspiring wound providers. She coordinates special events for the local WOCN and works with community outreach programs for community support. She has developed and co-authored several poster presentations at WOCN national conferences. She has presented at local meetings, sharing case studies and has been a guest speaker at several community colleges and universities in Phoenix. Kristina is an advocate for advanced wound care treatment modalities while preserving common goal development with her patients. She works with industry leaders and representatives to evaluate and trial new products to improve patient outcomes. Her coordination of care ensures that patients have access to latest wound care treatment advances. Kristina joined Valley Wound Care Specialists (VWCS) in 2012 after completing her Family Nurse Practitioner education. While employed at VWCS her role continues to develop and progress. She is an active patient advocate shares the vision of VWCS of treating the whole patient. Kristina enjoys traveling with her husband Bryan and is an active hiker enjoying many of Arizona’s state and national parks. She is a devoted football fan, loves her Arizona Cardinals, and is an active part of the Red Sea (even though she was born a Packer Backer). She is an annual team captain participant and fundraiser for the Walk for Alzheimer’s and participates in blood donation by giving platelets. She is one of three daughters, all of which are nurses.